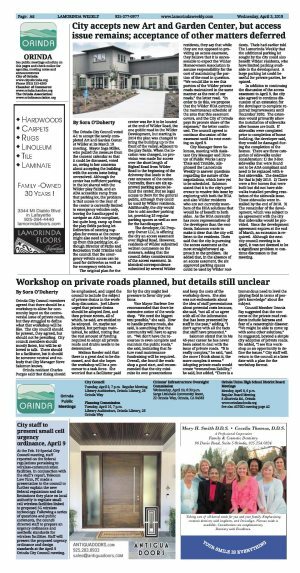 Orinda City Council members agreed that there should be a workshop to allow for community input on the controversial issue of private roads, but they struggled to define what that workshop will be like. The city council should be present, they agreed, but should not be presiding. City council members should mostly listen, but will be allowed to talk. There should be a facilitator, but it should be someone neutral and nobody that City Manager Steve Salomon knows. Orinda resident Charles Porges said that dialog should be emphasized, and urged the council to include the subject of private drains in the workshop discussion. Joel Libove urged that private drains should be adopted first, and then private streets, all of which, he said, are entitled to be adopted. Or, maybe not adopted, but perhaps maintained, he added, noting that the real amount of funding required to adopt all private roads and drains needs to be determined. Melissa Roeder said that there is a great deal to be discussed, and that she hopes the workshop will be a precursor to a task force. She worried that a facilitator paid for by the city might feel pressure to favor city positions. Vice Mayor Darlene Gee recommended that there be extensive notice of the workshop. "We need the biggest tent possible," she said. How to handle private roads, she said, is something that the community will have to agree on. "We don't have the resources to even complete and maintain the public roads," she said, indicating that future road maintenance fundraising will be required. Overall, she found the workshop a good start, and recommended that the city minimize its own presentations and keep the costs of the workshop down. She also was not enthusiastic about the idea of staff presentations about potential costs because, she said, "not all of us agree with all of the information that has been presented by staff in the past," adding, "I don't agree with all the facts that staff have presented." Salomon stated that in his 45-year career he has never been asked to deal with the issue of private roads. "It is really complex," he said, "and the more I think about it, the more complex it seems." Adopting private roads would create "tremendous liability," he said, but added, "There is a tremendous need to level the playing field in terms of people's knowledge" about the subject. Council Member Dennis Fay suggested that the concerns of the private road residents include fairness and fear of a catastrophic disaster. "We might be able to come up with some other solutions," he suggested, beyond a simple city adoption of private roads. He added, "I see this workshop as an opportunity to define the issues." City staff will return to the council at a later date with a plan for the workshop format.